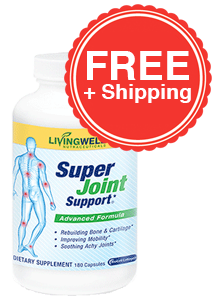 I understand that I am receiving a free bottle of Super Joint Support® paying only shipping & handling today, and that I will receive another bottle in 30 days for $49.95, and every 30 days thereafter, until the subscription is canceled. I also understand that I may cancel at anytime for any reason by calling (800) 216-4908, emailing, or logging into the online customer portal. To enable this button, please click the checkbox above the order button to acknowledge the terms and conditions of this Free Trial offer. Click here to close this message and continue.